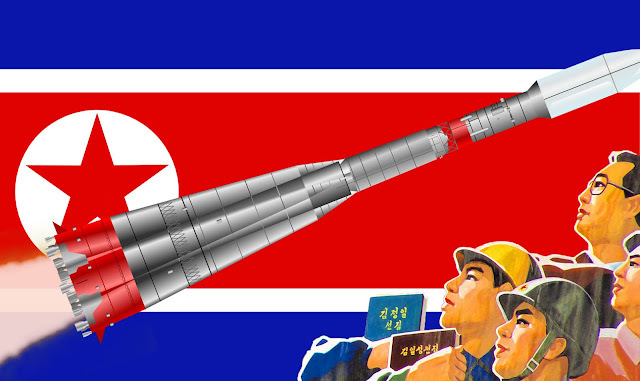 Image Attribute: Faux North Korean space propaganda. All elements public domain except for the human figures, from an image by Wikimedia user yeowatzup and used pursuant to Creative Commons Attribution 2.0 Generic license. The claim of a successful test of the hydrogen bomb (H-bomb) by the Democratic People’s Republic of Korea (North Korea) on 6 January 2016 shocked the international community, especially the peace and anti-nuclear advocates. The United Nations Security Council called an emergency meeting and many countries including neighbouring South Korea, Japan, and China condemned North Korea’s act on the same day. The security and defence experts called it a big setback to nuclear arms control and disarmament movement and speculated that North Korea’s move will escalate the race of nuclear arms in the Korean peninsula. Since the January, instead of a much pressure of international community, North Korea seems not to stop its nuclear programs. The recent H-bomb test shows the failure of the nuclear arms control process and forced peace loving people to think beyond ongoing nuclear arms control process. The first nuclear bomb ‘little boy’ was dropped on the Japanese city of Hiroshima on August 6, 1945, soon after another atomic bomb ‘Fat man’ was bombed on Nagasaki by the United states on August 9, 1945, in the World War Second. These kinds of weapons were different from those of the conventional warfare. These American nuclear attacks killed and wounded respectively almost 130,000 and 149,000. The nuclear weapons are more dangerous and harmful than the weapons of conventional warfare because it is a source of electromagnetic radiation also known as gamma rays, which can directly penetrate deep into the human body and could destroy body’s cells. In response, other major powers of that time went running to arm themselves with nuclear weapons, the Soviet Union in 1949 and Great Britain in 1952 carried out a number of nuclear weapons tests and many other were in the queue. Along with this horror race, the peace loving world community gave its attention towards this nuclear technology of mass destruction. The first such major initiative to ban testing nuclear weapons was taken by the Indian Prime minister Jawaharlal Nehru in 1954. 1. The PTBT 1963:- The Partial Nuclear Test Ban Treaty (PTBT) was the first attempt to stop the race of nuclear weapons making only after the Cuban missile crisis (1962). This treaty prohibited any kind of nuclear explosion in the environment, outer space or under water but it didn’t prohibit underground nuclear weapons tests. The nuclear weapons possessing nations agreed to check that nuclear weapon should not spread to other countries. Some critic it by saying that it didn’t prohibit underground tests and attempted to establish a hegemony of nuclear states. 2. The NPT 1968:- The Non-Proliferation Treaty (NTP) is the most controversial treaty among all nuclear arms control treaties. The NPT extended the legacy of the PTBT of the promoting hegemony of nuclear weapon states (NWS) over non-nuclear weapon states. It was extended for an indefinite time period and without any conditions in 1995. 3. The CTBT 1996:- The Comprehensive Test Ban Treaty is more wide-ranging than its predecessor PTBT 1963. It banned all kinds of explosions in the underwater, underground and atmosphere by everyone. Out of 183 signatories, 164 countries have ratified it. But the CTBT is not in force because of many countries, including the United States, India, Pakistan, North Korea didn’t ratify yet. Along with these above treaties, there are also a number of bilateral or multilateral treaties which try to control nuclear arms race. But all these efforts seem inadequate to bring down the nuclear race. The main argument of this article is that there are some intrinsic problems in the whole process of anti-nuclear movement which create obstacles and fear to non-nuclear countries on the way of adopting commitment of not acquiring the nuclear weapons. I would like to explain my argument in some points. First of all, I am going to explain the complexity of arms race in the perspective of realistic theories of international relations. It believes that in international politics, the states are the key players and individuals or international organizations play a secondary role and these actors are rational in the international political system. There is no super-national authority to enforce rules over the states. Thus due to the anarchic nature of international political system all states wish for power and maximize their own self-interest in order to ensure their own survival. Accordingly with this perspective, the nuclear weapons are the major source of national power in the contemporary world and that is why each and every state is gaming to acquire nuclear weapons. Second argument is that the nature of arms control initiatives was/is the nuclear hegemonic. The countries having nuclear arms are not willing to remove their own weapons but they emphasise to non-nuclear countries not to acquire nuclear weapons. This kind of nature builds the mistrust amongst non-nuclear countries. For instance, India, a leading advocate of arms control, has not signed NPT yet because of its discriminatory nature. Finally, I want to put that unfair and aggressive military intervention in the non-nuclear weapons nations by nuclear powers creates fear and mistrust towards arms control agencies as well as international organisations. In the recent history, Afghanistan, Iraq and Libya were the victims of the NATO countries’ military aggressions. It was blamed that Iraq had weapons of mass destruction (WMDs) and was attacked by the US. The US used its modern weapons including small nuclear devices in the war. The same kind of intervention happened in Libya in 2011. The intervening powers failed to provide any evidence of WMDs in both cases. The use of nuclear power against a non-nuclear nation is neither in favour of the spirit of arms control nor international laws. The justifications for the H-bomb intended the North Korean fear towards unipolar world system and it see accruing nukes is the legitimate right of a sovereign state for self-defence. Of course, prima facia the case of nuclear test by North Korea is provocative and against the spirit of denuclearization but when we analyse the process of nuclear proliferation by a developing country than we could find some fundamental and structural problem in contemporary world system and arms control movement. Here this write-up makes some suggestions to diminish nuclear dangers. 1. First of all, the nuclear arms control program must be more transparent and just. 2. The one-sided and unrestrained use of power by a powerful country or military organization like the NATO against less powerful country must be checked by the UNO and other international peace organizations. 3. The sanctions and coercive actions are not solutions because it creates fear and insecurity among sanction facing countries. We should focus on some peaceful means such as conflict resolution and confidence-building programs. Bharat Singh (TR Researcher ID: M-4988-2015) is a Doctoral candidate at Centre for African Studies, School of International Studies, Jawaharlal Nehru University, New Delhi. He submitted his MPhil dissertation on “Political Instability in Libya Since 2010 to 2014" (July 2015). His research interest areas are International Affairs, Neo-Imperialism and war in MENA region, Political Economy of third-world, Post-Arab spring and Democratisation in MENA and other Social and Political theories. He did his MA in Political science (2011-2013) from Banaras Hindu University, Varanasi (U.P.) with 1st division. He qualified University Grant Commission (UGC) National Eligibility Test in Political Science in 2013 and 2014 and in Defence and Security Studies in 2016.